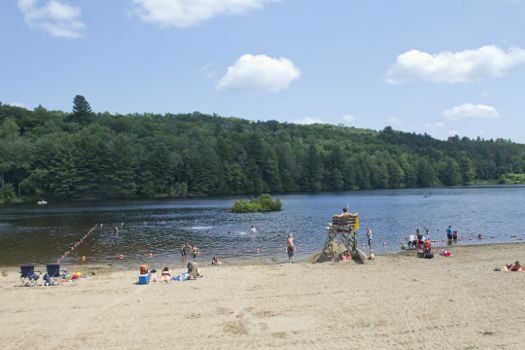 Cherry Plain State Park is at the Eastern edge of Rensselaer County, in the town of Berlin. 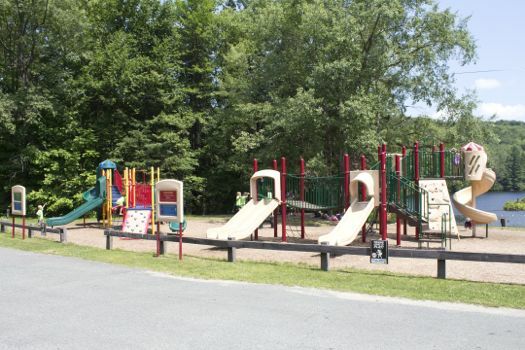 Since this park is practically in Massachusetts, it's a 45 minute drive east of Troy. Even though Cherry Plain is really far out there, it's a peaceful drive through the country. Just make sure you have directions in advance, because your cell service might cut out towards the end. 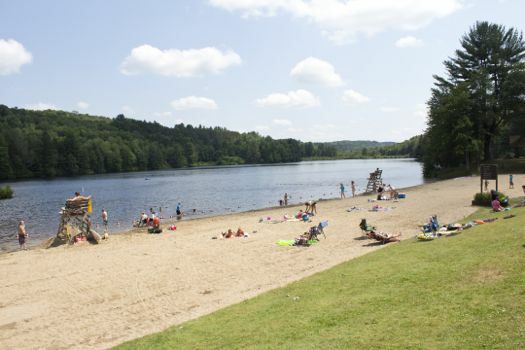 The beach along Black River Pond is what initially drew me to Cherry Plain. It's generally quiet and a lot less crowded than some other local spots, like Grafton Lakes. My most recent visit was on a summer day, and there was a large group of campers, but they generally kept to a limited section of the beach. The sand is decent, with texture falling somewhere in-between beach sand and pond dirt. There are lifeguards on duty and roped off swimming sections, so it seems quite safe for children. One of my favorite aspects of the beach area is the sloping hill leading down to the lake and ample tree coverage for shade. It's just as peaceful to sit and read a book with a view of the lake as it is to go for a dip. 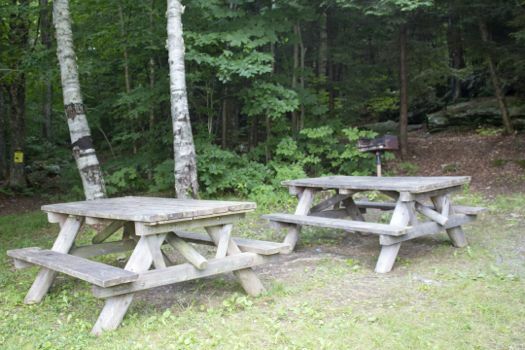 As with most other State Park facilities, Cherry Plain has picnic tables and camp grills. Unlike other parks, these areas are much more spread out --located up hills and around little nooks. This could be a big bonus if you're looking for privacy, but it could also be problematic if part of your group wants to be doing other activities, like swimming. 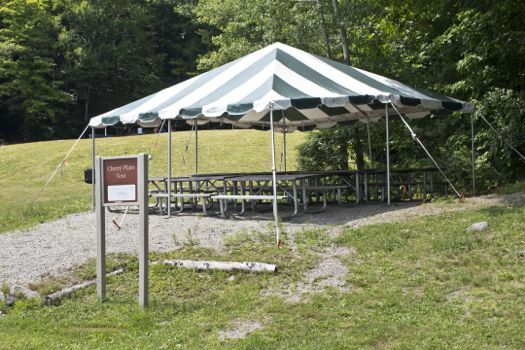 For a more organized affair, there are also two shelters with tables that can be rented in advance. 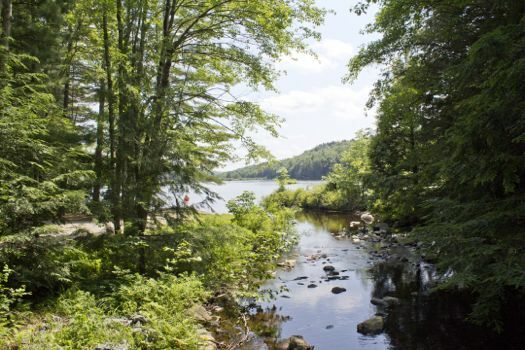 Cherry Plain's main body of water, Black River Pond, is extremely peaceful and idyllic. You can bring canoes and kayaks, but not motorized boats. 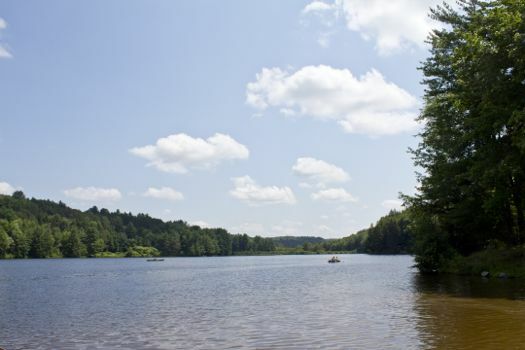 If you like to fish, you can find bass, bullheads, and pickerel in the water. It's easy to launch your boat right on the side of the beach area. 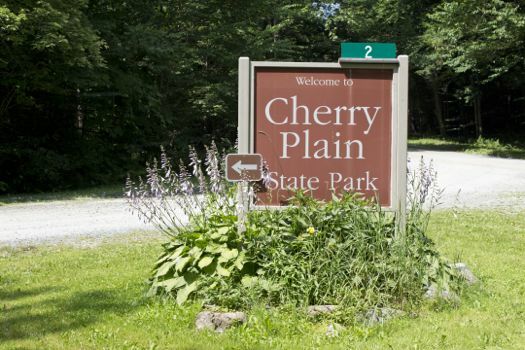 Cherry Plain has 30 campsites with varying sizes and levels of amenities, with rentals $12/night and up. All seemed to have the basic picnic table and a stone fire pit. Some spots even have a spectacular view of the lake. I noticed new bathroom facilities, which is a nice amenity for campers. Cherry Plain has just enough to keep you occupied. 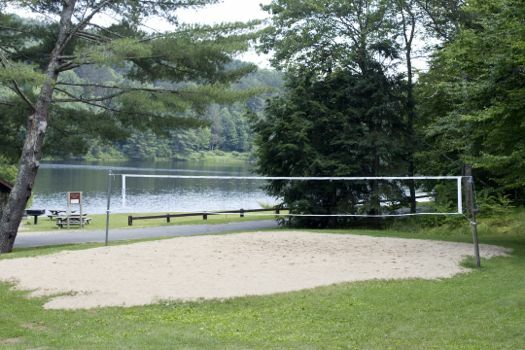 There's a multi-structure playground near the pond, along with one beach volleyball court and a single basketball hoop. Since the park really doesn't get too busy, those probably meet the demand. 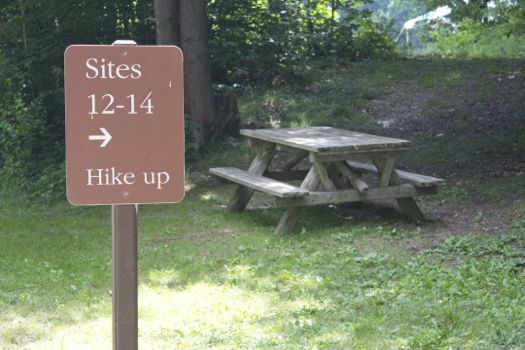 There are quite a number of hiking trails, but I found that they weren't well labeled or advertised within the park. The paths I have tried on various trips are less traveled, so they are a little overgrown and rocky. It's a great way to see some beautiful nature and water features, but you'll definitely need sneakers, and long pants wouldn't be a bad idea. Of course you should always check for ticks after a trek in the woods, since they are known to carry Lyme Disease in this area. I do really enjoy an easy walking path that's near the main beach and camping facilities. It has a bridge, rocks, and a stream. I'd imagine it's a great place for young children to explore. +Since Cherry Plain really is so far out in the woods, there are quite a lot of bugs. Even when visiting for swimming, you might want to consider bringing along bug spray. +There is no snack shack or really much for food around Cherry Plain. Plan ahead and bring all the provisions you'll need for your day at the park. +As I hinted at, you might not have cell signal out at Cherry Plain. Enjoy that time to disconnect. Entrance into Cherry Plain is $7 per vehicle. Camping and other equipment rentals are extra. But if you're planning on visiting a lot of state parks this summer, I highly encourage you to buy the Empire Passport park pass, which allows unlimited entry for $65 a year. The park is beautiful, but it is OUT THERE. Visitors should also be aware that the road to the park is not paved and can be quite bumpy. I've been meaning to check this place out for a while. This convinced me. The Empire Pass is a great thing. Aw, thanks guys! It's really a sweet park. And per cmm2581's note, when you think you're lost and the park couldn't possibly be any further down that unpaved road, you're just a few more minutes away. I really really want to bike out to there and camp. This was a great idea for a series and I'm enjoying reading about the various state parks, even the ones I already know fairly well. Looking forward to visiting them all in the future! I've taken great photos (an amateur nature photo enthusiast) at Cherry Plain, including one very much like the last one in this article. It's a great view from that spot. It is big and it is remote. If you're gonna wander, bring a compass (no cell service out there) and be careful. @ethan (though a week or so late): it's a pretty simple ride from Rensselaer county. The best way to go is through West Sand Lake, out Route 43 and then up Taborton Road to Dutch Church. 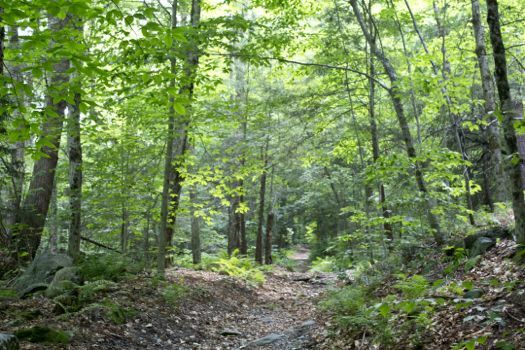 It's a decent climb, but beautiful, and you might think you're in the Adirondacks. When you get to the T at Dutch Church, there's a kinda rough road down into the park, but going this way is safest and least trafficked. @Carl: thanks for the tip!